DHA is the most important Omega element and is a vital nutrient for the brain organ development of the baby inside mother’s womb. Scientists have proved that during entire duration of pregnancy and lactation, pregnant and nursing mothers should take 400 mg DHA daily for optimum growth and development of baby’s brain. However our Indian diet is often lacking in omega-3 and thus babies may not get enough DHA from their mothers. Nutricharge DHA 200 is the most simple and convenient way to take pure DHA. Fully vegetarian capsule of Nutricharge DHA 200 contains 200 mg of pure, 100% vegetarian DHA and is recommended for every pregnant and breastfeeding woman and also for women planning a pregnancy. DHA supplementation helps avoid Pre-term birth and optimizes “weight at birth” of the new born. DHA also helps in baby’s eye development and increases the learning ability of the infants. Nutricharge DHA 200 is a 100% Vegetarian Veg soft capsule containing 200 mg of DHA obtained from 100% vegetarian algal source. So, both the capsule and DHA in Nutricharge DHA 200 are produced from plants (algae). 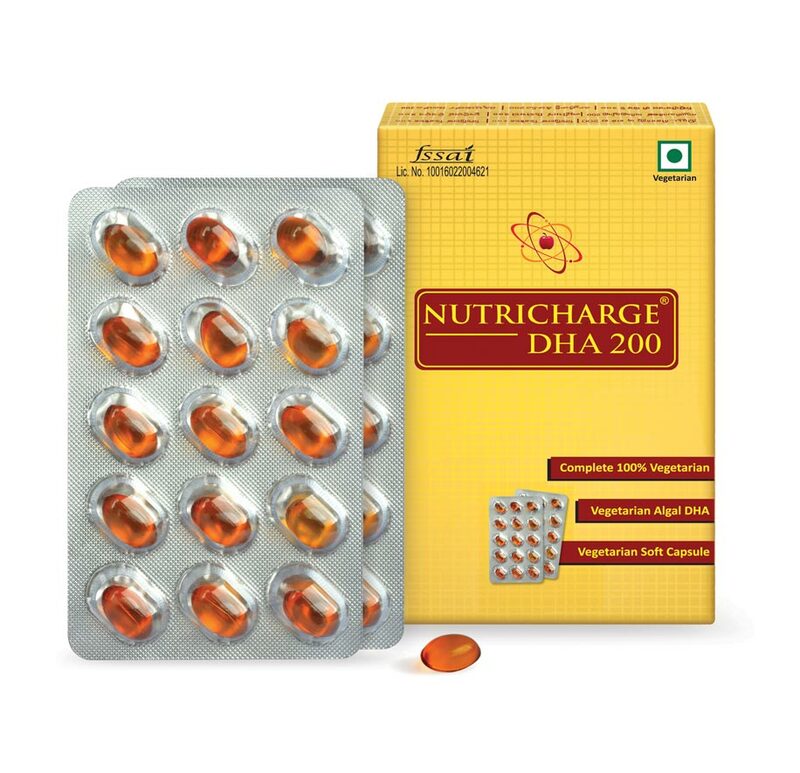 Nutricharge DHA 200 is very simple and convenient to consume and the capsules are caramel flavored. Nutricharge DHA 200 is available in a consumer friendly pack of 30 capsules (2 strips x 15) in a box. 1capsule of Nutricharge DHA 200 should be taken twice daily after meal. To be taken every day at the same time.